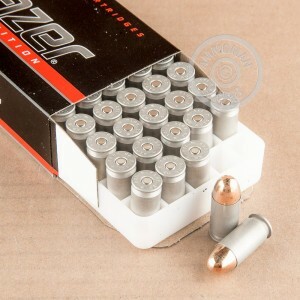 CCI's Blazer aluminium-cased ammo is a popular choice for range use among many shooters. This 1,000 round case of .45 ACP ammo, which uses standard 230 grain bullets, is a great target load for your 1911 or other .45 Auto pistol. Although the aluminum cases cannot be reloaded, they provide reliable feeding and cost significantly less than brass, helping you save money up front. 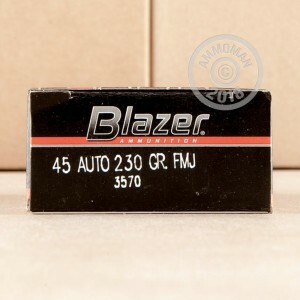 Blazer ammo also comes with a hidden benefit--its copper jackets are made with a plating process that covers the base of the bullet, reducing potential lead exposure for the operator. A great value for indoor and outdoor ranges alike. Each case contains 20 boxes with 50 rounds in each box. 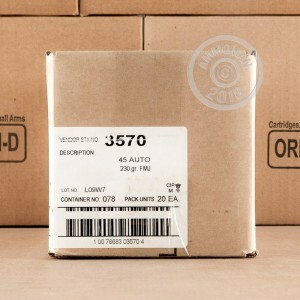 The price listed here is our up front price for this ammo with no hidden fees. Free shipping for orders over $99 is included! Good Ammo, good price, very satisfied.